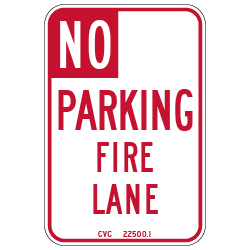 R26F California No Parking Fire Lane Sign with CVC Code 22500.1 - 12x18 - Reflective heavy-gauge rust-free aluminum No Parking Sign. NOTE: NO STOPPING is the correct wording for California, not NO PARKING. This sign is NOT compliant with California Regulations. Click HERE for the correct California Compliant R26F No Stopping Fire Lane Sign. DOUBLE the working life of your No Parking Fire Lane Signs by selecting our Protective Overlay Film (POF)! Our POF provides additional protection against fading caused by the sun and harsh weather—and makes graffiti and sticker defacement damage easy to clear away without harsh abrasives.